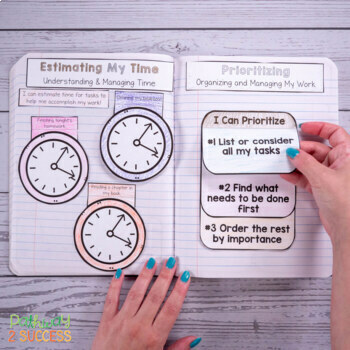 Teach specific executive functioning skills with an interactive notebook, filled with hands-on lessons, notes, and activities! An interactive notebook (INB) is a set of lessons, notes, and activities put together in one notebook. Each student will create their own executive functioning interactive notebook. For each lesson, students color, cut, glue, and complete activities that they add to their notebooks as they learn about specific skills. Not only do students learn the skills as they are completing the activities, but they are creating a tool to refer back to lessons and skills, as needed. Skills targeted in this unit include planning, organization, time management, task initiation, working memory, metacognition, self-control, sustained attention, flexibility, and perseverance. Just use the detailed lesson plans to guide you through each lesson and activity. There are a total of 11 lessons, each with several activities and notebook pages focused on that skill. Depending on the time you have for your group, you may get through 1 to 3 sections of each lesson per day. Students simply follow the directions on the bottom of each page to color, cut, and put their notebook page together for each skill. The pages include a variety of activities from foldable crafts, writing, reflections, and more. I've included a MODEL notebook document with real photos of every single page and how it should look. This can be a helpful tool for both educators and students putting their notebook together. Best of all, you can print this out and keep it as a visual model notebook for your kids in case anyone is absent and needs to finish a page on their own. This notebook can be used in large or small groups by the regular education teacher, special education teacher, or other support professional. These materials can also be used during advisory for middle and high school students. While all students can most assuredly benefit from learning strategies to strengthen executive functioning skills, some examples of students most in need include those with ADD/ADHD, Asperger’s Disorder, and Learning Disabilities. What Materials Will Students Need? 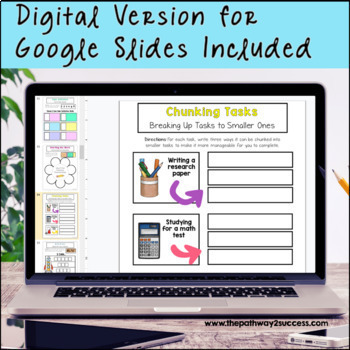 Materials needed include: composition notebooks, coloring materials (your choice), scissors, printed notebook pages included in this resource, and glue or tape. You can choose to assign students to bring these materials in or provide them for your learners. 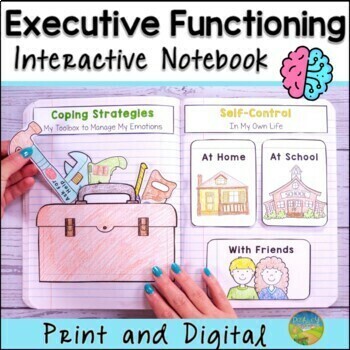 Need More Executive Functioning Skills?